Goal Actual Industrial Counters contribute to better efficiency, communication and work place safety within your industrial enterprise. Our Goal/Actual Production Counters work similarly to the single production counter but with an additional LED display to show the Goal count. While a simple counter shows how much a manufacturer is producing, an additional goal display shows how the manufacturers are doing in relation to a target. Show a static Goal number or an increasing Goal with TAKT/Pace Timer. LED Production Counters keep an accurate count of material or products and provide a visible display to both employers and employees. Production Counters are the perfect and affordable solution for small companies looking for a simple number counter or larger companies looking for a more sophisticated data-tracking system. Add a static Goal or changeable TAKT Timer to the production counter to see the efficiency of your production line compared to your goals. ► Actual Count Up/Down by increment of one with switchbox or relay closure. 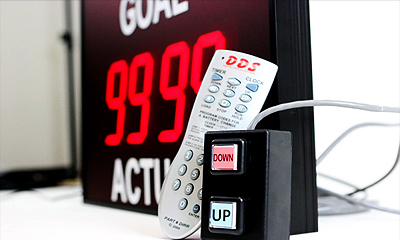 ► Set static goal number or countdown pace timer with wireless remote. 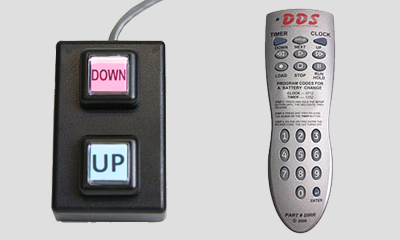 ► Easily switch between 2-digits or 4-digits counting. 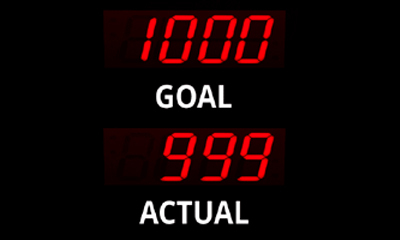 ► Two line bright red 4″ height digit display (2.5″ and 7″ digit sizes available). ► Sturdy anodized aluminum frame and protective non glare lens. ► Lithium battery backup to save data in case of power outage. ► System capable to sync with relays or other production counter displays. ► Add photoelectric diffuse or proximity sensors for faster counting. Photoelectric IR Sensor – Typically installed in industrial plants ranging from food and beverage, textiles, ceramics and brick production, through to logistics. This photoelectric sensor has high reliability and enhanced performance includes through-beam, retro-reflective and diffuse reflective types in straight and radial versions. Straight versions are also available with background-suppression, limited-reflective detection, and transparent object detection types for special applications. All models are available in plastic and metal housing. Proximity Sensors – Available in models using High-frequency oscillation to detect ferrous and non-ferrous metal objects and in capacitive models to detect non-metal objects. Models are available with environment resistance, heat resistance, resistance to chemicals, and resistance to water. Applications includes: Detects lead frames, aluminum caps, components, machine movement, cylinder positioning. We are experienced in helping customers define your needs and refine your ideas. We also understand that every business has unique needs and priorities. Call 800 346-4474 for a fresh approach to Dynamic Visual Communication.
.:: Find Us On Facebook ::.